About Ann Van Eron, Ph.D.
Executive Coaching is a significant practice because it has the power and “magic” of transforming individuals, teams, and organizations. For example: An executive needs to mobilize his team’s commitment and creativity to demanding organization goals. However, the executive uses his habitual model of micromanaging, focusing on controlling rather than supporting team initiative. This controlling approach has served him well in the past, and under current pressure it persists, despite its failure to achieve the desired innovation and commitment. This article will provide some insight into how a Gestalt trained coach would assist this client in identifying specific wants and needs related to developing a more open leadership style, while working with the resistance patterns that interfere with his ability to realize those needs and wants. Through a non-judgmental examination of the client’s present internal and external processing, what we describe as the “what is picture,” and through exploration of and experimentation with new behaviors, the Gestalt coach enhances client awareness and co-creates digestible learning experiences. New choices are opened to the client, who becomes better equipped to access experiential resources and desired goals. 1) An integrated presence and intentional use of self as coach; 2) Skillful tracking of and movement with the interaction between the Cycle of Experience (COE) and the Unit of Work (UOW); and 3) Mastery of working with awareness and the force of resistance to support new learning and new possibilities. As the first “integration” theory to successfully oppose widespread reductionism in the behavioral sciences during the 1950s, Gestalt is an organic model that focuses on bringing into conscious awareness and choice one’s exterior and interior reality in order to achieve personal coherence and satisfaction (Perls, Hefferline & Goodman, 1951). Gestalt-based coaching can be called “metamorphic coaching” in that it calls for client transformation achieved through such awareness and integration. A central teaching in Gestalt coaching is the “use of oneself as a coaching instrument” in the role of intervener. Through such use of self, the Gestalt coach establishes a “presence” that supports client awareness. This use of self cannot be taught in a prescriptive or normative manner, since each coach will draw on unique personal experiences and knowledge, and each coaching encounter will present unique constellations of opportunity for the coach’s use of self. 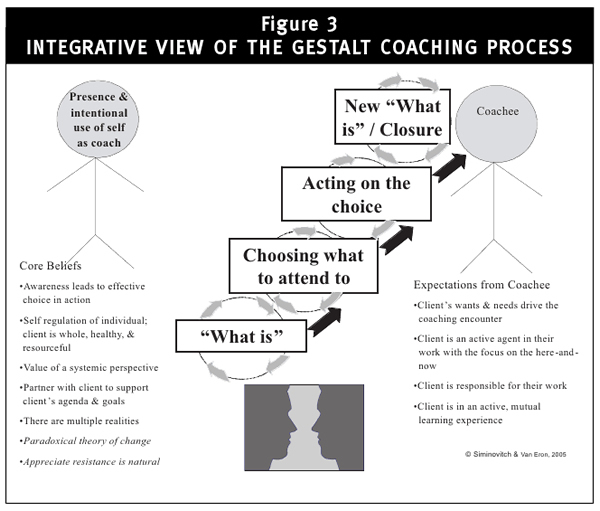 Gestalt coaches thus learn to selectively share observations that seem most pertinent for heightening client awareness, and they learn to allow the coaching process itself to suggest appropriate structures for and timing of intention-directed interventions. Furthermore, sharing one’s interior with a client serves to ground the interaction in an intimacy that supports taking important personal risks that the client might otherwise perceive as too threatening. Carter (2005) references practitioner identity and the effective use of self as core aspects determining mastery as coach and OD consultant. Yet the complexity that characterizes any attempt to work for sustainable learning and change in individuals and human systems—involving simultaneous and interconnected dimensions of physical, emotional, intellectual, and spiritual factors—can be daunting, to say the least. Where to begin? For Gestalt-based coaching, the first step is self-work, i.e., awareness of what one personally brings to the coaching effort: life experiences; an intellectual repertoire; particular skills or strengths as well as particular weaknesses or vulnerabilities; spiritual values and beliefs; and physical presence itself. As the first level of system, Gestalt coaches are required to be aware of, to accept, to own, and to be responsible for the presence they establish in the interactive field. A value attitude permeates Gestalt coaching. The client is regarded from the start to be functioning as a whole, healthy, and resourceful entity with respect to environmental conditions. This attitude differentiates the activity of coaching from that of “therapy,” which traditionally construes the client to be in some manner deficient and in need of regulated remediation. Gestalt coaching eschews “therapeutic,” remedial problem-solving, accepting instead the premise that the client already possesses the necessary resources to meet their needs and achieve their goals. Another differentiation between therapy and Gestalt coaching can be seen in the conception of resistance as an adaptive and positive force that serves a protective function for the client; resistance must not be “overcome” or eradicated, but rather brought into awareness and worked through in a way that enables the client to recognize its constructive function and to re-channel its energy as a support in the current situation. Gestalt coaching therefore emphasizes bringing into awareness those habitual behavioral or ideational patterns that interfere with clients’ inherent capacity to meet their needs and achieve their desired goals. Without awareness, no effective action can be conceived, articulated, or taken. As an agent of awareness, the Gestalt coach encourages clients to pay attention to and thereby acknowledge what is true and real for them in the moment, whether emotional, ideational, or physical. Clients’ immediate experience is perceived as the primary opportunity for exploration, for learning, and for taking new action towards new goals. Through this conjunction of awareness and acknowledgement, clients discover how they integrate—or fail to integrate—learning in order to make meaning of their experiences. Gestalt coaching also holds to the belief that emotion and failure are both pathways to learning. Growth occurs best through exploring behaviors that would otherwise be too “dangerous” without the supporting presence of the coach. The Gestalt coaching encounter offers a safe arena where vulnerability, strong emotions, and failure can play themselves out in the service of learning and growth. The impact of learning through venturing into new behavioral territory, taking personal risks, and discovering new meaning through such exploration is the impetus for the Gestalt coaching technique of co-created experiments. These experiments are opportunities for clients to increase awareness and undertake alternative action towards desired goals. In constructing these experiments or other interventions, Gestalt coaches remain aware that individuals exist and act within multiple levels of system, i.e., self (intrapersonal), interpersonal, group, or organizational. Determining where the coaching work needs to occur for the greatest results is an important skill. For example, the controlling executive client will benefit from work at the level of self where he can explore his issues of control; he will also benefit from work on his interactions with team members at the interpersonal or group level of system. The Paradoxical Theory of Change is the overarching Gestalt theoretic perspective for the coaching encounter. A fundamental intervention in Gestalt coaching is to sharply focus attention on what already exists for the client in the present, with the paradoxical result of initiating a profound experiential shift towards something new. This perspective acknowledges that the client is in fact his or her own “expert,” and that the coach’s strongest function is to provide a supportive presence, to be a collaborative partner, and to serve as the witness to the client’s work and learning. Attending to one’s own sensations, emotions, and thoughts as part of the coaching process. Effective and appropriate use of self requires that the Gestalt coach monitor and discerningly share personal sensations, emotions, and thoughts. Differentiating between and selectively sharing observations, interpretations, and judgments. Data derived from various sources—clients’ self-reports, the coach’s observations of client behavior and language, and self and others’ reactions to behavior and language—must be correctly identified and appropriately used on the client’s behalf. Establishing a dialogical relationship with the client. Knowing how to create the trust and intimacy necessary for the client to feel safe sharing his/her interior with the coach through effective use of self and the selective sharing of one’s own interior. Recognizing and working respectfully with resistance. Resistance is understood in Gestalt coaching to be an adaptive strategy in the face of perceived threat, and therefore is honored and worked with as a constructive force that holds important information and energy for the client. Supporting the client’s learning, experimentation, and movement into action. The Gestalt approach is both experiential and experimental in nature, and thereby transformational (rather than transactional) in intent. Making constructive use of negative feedback and failure in ways that increase clients’ self-knowledge and support sustainable learning and change. The experience of failure, properly articulated and attended to, offers lessons generally more valuable than the experience of success. Incorporating a context- and systems-based perspective into interventions. Clients exist in multiple environments and function as part of larger systems; these effect self-organization perceptions and patterns. Identifying intrapersonal, interpersonal, group, and organizational levels of work, and adapting interventions to the specific and relevant system level, is essential. Developing greater mastery of use of self as coach and inculcating the same in the client. The coach models congruency between identity and action, and thereby inspires and teaches clients how to achieve the same for themselves. Honoring and working with diverse cultures, backrounds, and perspectives. Embracing diversity and appreciating multiple realities are critical competencies for the Gestalt coach. As a vital and powerful influence in the relational field, the coach’s presence should offer a supportive and hopeful avenue into the complexities of human learning and change. Conversely, Gestalt coaching also has high expectations of the client. Gestalt-based coaching is a collaborative partnership where coach and client together define the partnership and develop a set of goals to guide their work. This agenda can be revised as desired or necessary, and involves ongoing mutual review and reflection on the process and progress of the work. Coach and client co-create learning and exploratory experiments. Since it is the client’s needs and goals that drive the coaching encounter, the client is expected to be an active agent in his or her own learning. The coach helps to clarify and support the work; and the client is ultimately responsible for that work. As a present-focused approach, Gestalt coaching seeks to recognize critical choice points for action that exist in the moment but that promise long-term effect. All strategic planning can fall flat if the moment for delivery is missed. Being able to track and attend to the fluctuations of awareness throughout the coaching encounter, and so to be ready when that moment emerges, is the heart of mastery in Gestalt coaching. Effective use of self in the coaching encounter is guided by the Cycle of Experience (COE) and the Unit of Work (UOW), which serve as perceptual and intervention tools for tracking and heightening awareness. The COE is used to assess the blocks to awareness and patterns of resistance relative to desired goals. The UOW is used to design and shape the appropriate intervention. The COE is continually referenced as a tracking lens for spotting the available energy needed to shape digestible Units of Work. Developed at the Gestalt Institute of Cleveland, and first applied in organization consulting by the Institute’s Organization & Systems Development Center, the COE is a powerful conceptual frame for “seeing” natural and ongoing experiential processes of need-fulfillment at any level of system (individual, group, or organization). As a normative template for human experience, the COE must be understood to apply equally and simultaneously to both coach and client. Awareness of the COE provides the skilled Gestalt coach with a way of identifying more precisely where processes become “stuck,” thereby preventing learning and change, and for creating interventions that help clients recognize for themselves the habitual locations and patterns of becoming stuck. Returning to our directive, controlling executive: He remains committed to the fixed pattern of awareness he has become habituated to; he is literally unable to “see” or acknowledge new behaviors and initiatives by his team members. Even as he calls for innovation, he remains fixed in his own awareness pattern and consequently does not get his initiative needs met. The process of need fulfillment and natural change is represented through the COE. The Gestalt coach utilizes the COE to track an individual’s (and larger systems’) movement through naturally occurring experiences. Individuals are always confronted with a multiplicity of needs, such that numerous cycles can be tracked according to sensations, awareness, energy, action, contact, and closure or withdrawal (Zinker, 1977). Gestalt coaches track their own COE while also attending to the COE of the client in order to determine those behavioral patterns that support or interfere with the client’s stated goals. Nevis (1987) assumes that although people say they seek a change, some part of them nevertheless resists this change. Over time, this resistance falls out of the client’s awareness but continues to interrupt or block the desired change. The coach’s job is to assess the client’s COE pattern and find ways to heighten the client’s awareness of this experiential pattern such that new choices in behavior can occur. In working with the over-controlling executive, for example, the Cycle helps the executive become aware of his pattern of imposing his view (figure) on others, which interferes with the company’s need and demand for innovation. Our over-controlling executive benefits from becoming more aware of how his pattern of dominating his staff interferes with team initiative. The coach has the intention of working with the client’s manner of stopping himself from seeing new possibilities. For example, the executive benefits from becoming aware that he quickly moves to the action of demanding compliance before understanding a team member’s perspective. Identifying the “What Is.” This step addresses the client’s current behavioral patterns as these are embedded in the client’s habitual COE patterns. Choosing what to attend to. This collaborative step sets forth an agreement for work on a specified “figure” or issue that is most important for the client. Acting on the choice. The coach works to co-create a learning experience by designing and guiding an experiment that is risky for the client in terms of trying out new behavior but conducted in a safe environment, thereby enabling the client to garner new perspectives on the issue. Coming to a new “What Is.” The work is closed out by articulating and honoring the learning that has occurred. 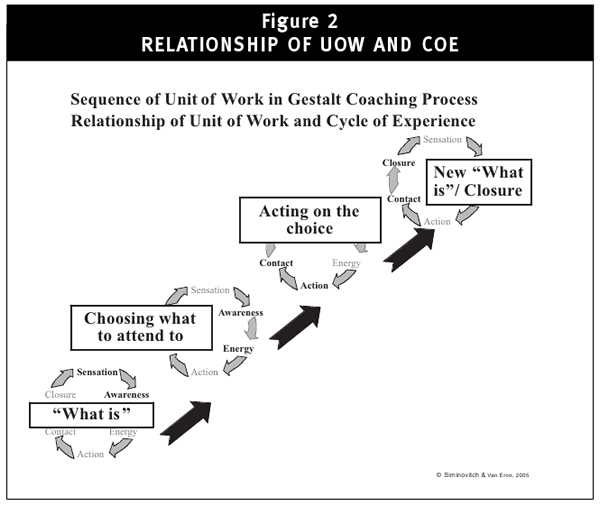 Both the COE and the UOW models enable the Gestalt coach to detect interruptions or blockages in process, i.e., resistances to change. In recognition once more of the complexity of human experience and of working with human systems, Gestalt coaching makes constructive use of resistance by keeping in mind what Beisser (1970) has tagged the Paradoxical theory of Change: Change does not occur by trying to be what one isn’t but by fully embracing who one is. Using the COE, the Gestalt coach looks for where resistance is occurring out of the client’s awareness and brings this hidden element into the light of consciousness. The paradox embedded in the Gestalt theory of change rests on encouraging the client to fully embrace the resistance as a current reality as well as an energy that is useful but misdirected; that is, one does not automatically condemn the resistance as a deficiency but welcomes it as an indicator of strength and a source of energy. This experience of naming and bringing out from the interior what was unaware or invisible enables learning and change to occur; the more the client understands and accepts his or her current reality, the stronger the contact with self—”there will be a transformational shift and a new awareness of behavior” (Rainey Tolbert, 2004). Our executive is not aware of how his over-controlling pattern negatively effects his team members. Becoming aware of this pattern enables him to see and experience new possibilities. Career and job transition are increasingly common in the contemporary work environment. Most decisions around such transitions are purely cognitive and “rational,” presuming that past interests and skills provide the strongest base from which to move forward. Professionals often believe they should be looking within the same industry, the same field, the same organizational format. While there is self-evident value in such a view, it produces constricted choices and unhappy results for those who are ready for change and growth but who simultaneously feel uneasy, if not actually threatened, by the thought of change. People forced into change situations are usually unable to accurately track their own experiential dynamics. Gestalt coaching interventions explore and bring into awareness the complex and dynamic interplay between wants and needs, values and resistances. The client is able to see potentialities that a purely cognitive or rational point of view has obscured or pushed out of awareness, and new possibilities are opened. Further, the vibrant wisdom of sensations and experience are made accessible by paying attention to one’s own experience of learning and change effected through the Gestalt models of the COE and UOW. For example: An executive comes to talk about his difficulties completing an important project on time. The coach observes a hesitant and confused delivery of content. The coach slows down and walks the executive through his own COE, and the client then identifies feelings of fatigue and concern over retention. The executive is actually worried that once he completes the project, he will be eased out of the organization. In this case, not finishing the project held value for the client. Attending to the nature of the delivery of the content rather than to the content itself allowed this relevant and useful data to emerge. The uncommon practice of attending so closely to process and experience makes Gestalt coaching a robust and life-giving practice in today’s organizational environments. A core theme in Gestalt coaching is how to help clients—executive or otherwise—improve the ways they scan their internal and external environments, gather data, and make sense of that data in order to expand choices and engage in more productive behaviors with respect to desired goals. There is power in supporting clients to share their interior and to have the experience of being heard under the avowed premise that they are already healthy, whole, and resourceful. The primary gift a Gestalt coach brings to the coaching encounter is an integrated presence, wherein behavior and use of self are aligned with core values and full access to emotional life. The Paradoxical Theory of Change and the positive force of resistance are central values for the Gestalt coach. 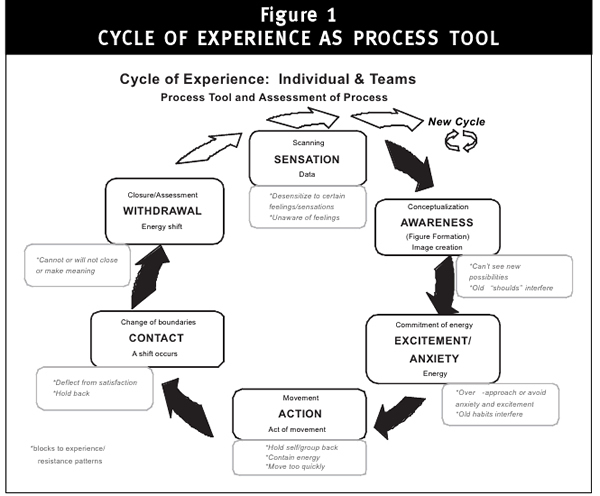 The theoretic and conceptual models of Cycle Of E experience and Unit Of Work that shape Gestalt coaching are deceptively simple but powerful ways of envisioning human behavior and being able to create effective learning experiences. Only a commitment to ongoing practice and self-reflection will further one’s journey on the road to coaching mastery. When those moments of integrative practice happen in the coaching encounter, the client understands the magic of new possibilities. When those moments of integrative mastery happen in the coaching encounter under the guidance of the Gestalt-trained coach, the experience is magical. Beisser, A.R. (1970). The paradoxical theory of change. J. Fagan and I. Shepherd (Eds. ), Gestalt therapy now. Palo Alto: Science and Behavior Books. Carter, J. (2004). Carter’s cube and a Gestalt/OSD Toolbox: A square, a circle, a triangle, and a line. OD Practitioner Special Issue (36:4). Nevis, E. (1987). Organizational consulting: A Gestalt approach. Cleveland: Gestalt Institute of Cleveland Press. OD Practitioner Special Issue. (2004). Organization development and Gestalt: An ongoing partnership (36:4). Perls, F., Hefferline, R., & Goodman, P. (1951/1994). Gestalt therapy: Excitement and growth in the human personality. Highland, NY: Gestalt Journal Press. Rainey Tolbert, M.A. (2004). What is Gestalt Organization & Systems Development? All about the O, the S, and the D…and of course, Gestalt. OD Practitioner Special Issue (36:4). Zinker, J. (1977). Creative process in Gestalt therapy. New York: Vintage Books. This entry was posted in Main by Ann Van Eron. Bookmark the permalink. Are You Willing for It to be Easy? When you register for this information-packed interview, you will also receive a complimentary subscription to Openings—Leadership Tips for Unparalleled Results, delivered to your email box, twice monthly.